Japanese is a polysyllabic, highly inflected language but is not a tonal language like Chinese, with words that change meaning depending on the tone or pitch in which it is spoken. Japanese is grouped in the Altaic group of languages which includes Korean, Mongolian and Turkish but not Chinese. Many say that in terms of hearing and speaking Japanese is not that difficult to learn. The hard part is reading and writing, especially the kanji (Chinese characters). People need to know three alphabets to read a newspaper in Japan. The difficult-to-master Japanese writing system consists of two phonetic alphabets---51-letter hiragana (for Japanese words) and 51-letter katakana (mostly for foreign words)---and Chinese characters known as kanji. Most Japanese understand around 2,000 kanji characters. Educated Chinese, by contrast, can read about 5,000 characters. There are many theories about the origin of the Japanese language. A number of scholars believe that syntactically it is close to such Altaic languages as Turkish and Mongolian, and its syntactic similarity to Korean is widely acknowledged. There is also evidence that its morphology and vocabulary were influenced prehistorically by the Malayo- Polynesian languages to the south. It is believed that the proto-Japanese language and proto-Korean languages separated around 6,700 years ago around the time the Jomon period (10,000 and 400 B.C.) people were firming up their grip in Japan. Korean has a sentence structure similar to that of Japanese. And, big Korean words are often similar to words in Chinese and Japanese the same that some big English words are similar to Latin-based words in French and Spanish. Although Japanese is predominately an Altaic language it has some similarities to Austronesian, a linguistic group associated with Micronesia, Melanesia and Southeast Asia. Ural-Altaic languages include Korean, Finnish, Mongolian, Hungarian and Turkish. These languages are unrelated to any of the world's other major language groups and they originated from the Altaic region in Mongolia and Siberia. According to the Japan Foundation and Tokyo’s Marubeni Research Institute, three million people were studying Japanese abroad in 2003, compared to only 127,000 in 1997. Some 12,200 institutions in 120 countries offer Japanese classes. About 900,000 of those studying Japanese are in South Korea. Sentence structure in Japanese is often reverse that of English and the subject and pronouns are often not present. Hence an English sentence like "I'm going to Tokyo" when said in Japanese results in "Tokyo to going." The Japanese and Chinese languages are very different. They have no similarities in syntax and vocabulary. Chinese is a monosyllable language while Japanese is polysyllabic, meaning that Chinese words are usually represented by a single syllable while most Japanese words have two syllables or more. Chinese words generally do not change their form while Japanese words do. The Japanese and Korean languages are related. Both have similar sentence structures and both were influenced by Chinese and have incorporated Chinese words. But Japanese is so different from English that word-for-word translations often result in mind-numbing indecipherable sentences. In Japanese there are many homophones (word with the same or similar sounds but different meanings). The Tokyo dialect is the standard Japanese hear in news broadcasts an in the Tokyo area. Kansai-ben (Kansai dialect) is the dominant form on owari bangumi entertainment programs as many comedians and entertainers are from the Kansai and make many jokes in the Kansai dialect. 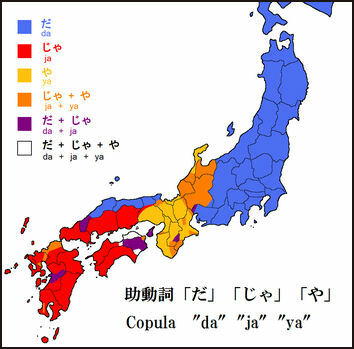 The dialects spoken by the people of Kyoto and Osaka, in particular, continue to flourish and maintain their prestige. The Osakan dialect is almost like the Japanese equivalent of cockney English. It is full of colorful expressions and is the source of amusement in many comedy routines. The preferred insult in the Tokyo area is “baka.” It roughly translates to “idiot.” In Osaka the preferred word is “ahoya,” which roughly means “foolish,” as in making mistakes that all people make at one time or another. The Kyoto dialect is so formal it is almost like the Japanese equivalent of Shakespearean English. People from Miyazaki are known for speaking with a particular accent and those from Tohuku are regarded as speaking in a funny peculiar way. The Japanese probably say "thank you," “excuse me”and “I’m sorry”more than any people. Not only do they offer thanks for all kinds of situations they also say thanks many times in regard to one thing. Japanese are also constantly saying things like the equivalent of “thanks so much for your effort”for doing mundane things like offering them a tissue or “it was a feast” when you give them some tea and cookies. The goal is maintaining social harmony by ensuring recognition and appreciation for good deeds. The custom of gift giving also rooted in this desire. Some say Japanese politeness is rooted in the Japanese language. There are countless ways to excuse oneself and say "I'm sorry" and elaborate verbal rituals that have been devised to avoid coming off as too direct or rude. There are also numerous honorifics (polite ways of addressing people). 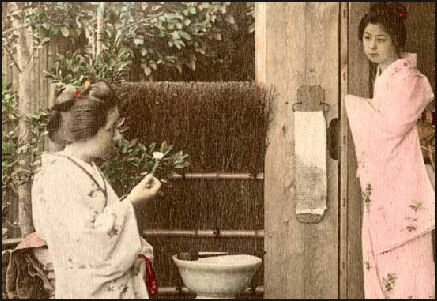 Many Japanese begin written correspondence, for example, with the honorific hankei, which literally means "your enlightened worship." Sentences that offer a suggestion are often left hanging to leave open a polite refusal from the person being talked to. Developed during the feudal period, keigo (the Japanese language of respect) stresses respect for the person being talked to and emphasizes the humility of the person doing the speaking. Sometimes even things like lunch and tea have an "honorable" thrown in front of them to soften them up. The younger generation doesn't use traditional polite Japanese as much as their elders did. The language that is used is often defined by the relationship between the speakers, their social status and the content of the conversation. It is not uncommon for one speaker to say “yes” but actually mean “no” with the other speaker---unless he is a foreigner---immediately picking up on it. Employees talking to their superiors will generally use honorific language and humble language when referring to themselves. But when talking about the same superiors outside the office they will use humble language. By the same token a person may call a close friend by his or her name without attaching the polite -san but will use it when talking about the friend to the friend parents. Over time Japan has become less formal. Parents and teachers no longer expect their children to use honorific language. Some companies have even issued orders to their employees to stop addressing one another by their titles but to simply add the suffix -san to their names. 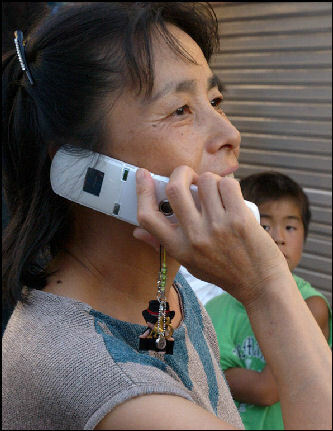 Once described as the "greatest barrier to human communication ever devised," Japanese has a word order that is difficult for Westerners to master; information is often is exchanged in indirect ways rather than direct ways; and separate sets of words are used when speaking to friends, people of higher status and people of lower status. Former United States Ambassador to Japan Walter Mondale gave up learning Japanese but after only one lesson. Many Japanese have problems with their own languages. Politicians often don’t understand the kanji (Chinese characters) in their own speeches and students have difficultly expressing what they really mean. A study in 2000, found that 81 percent of Japanese adults surveyed were confused by Katakana words. Studies have also shown that many Japanese do not know what common proverbs mean. Some foreigners that speak Japanese well say that what makes Japanese so difficult to learn is not so much the language itself but the subtle way Japanese communicate. The Japanese people, for example, love to abbreviate or slightly alter phrases to express multiply meanings and "encapsulate a variety of nuances in a single word or phrase." Longtime resident of Japan John David Morely, once wrote, he "was accepted as a speaker of Japanese only as he became to his own ears, progressively inarticulate." He described a typical Japanese question as "suggestive, full of loopholes, offering escape hatches, and in fact unlike a question as it was possible to be" and said answering a question was "aiding and abetting the person who had asked the question" and "an accessory to the answer." In his book Japanese Beyond Words , Andre Horvat wrote, "The essence of Japanese-style communication consists of avoiding the equivalent of English pronouns as much as possible and configuring other parts of speech, such as verbs, nouns, adjectives and adverbs---even interjections’so that these other parts of speech transmit the clues as to who is talking to whom and about whom." The longest word in Japanese has 12 letters (compared to 45 for English). There are 93 Japanese equivalents for the pronoun "I". Banzai! ("May You Live 10,000 Years") was the Samurai equivalent of "Charge!." It is now shouted at the completion of a task, when a mountain top is reached, when salarymen take on new positions and when newlyweds leave on their honeymoon. The Japanese word for thank you, arrigato, comes from the 16th-century Portuguese word obrigado. Pan, the Japanese word for bread, is also derived from Portuguese. In Japan dogs go "wan wan wan" instead of bow wow wow; cats go "Nyaah-nyaah;" frogs croak "kero kero"; and roosters bello "ko-kek-ko-ko." The noise of pig in Japanese is "buubuu." Japanese often confuse blue and green. In the past they used the word aoi to cover a range of colors from blue to purple. There are no real swear words in Japanese and few strong insults aside from kuso (‘smelly”) and baka (“fool”). Verbs without the appropriate polite endings are considering insulting. About the worst scolding one can receive is ul sai na (“you are noisy”). It has been said that there are more words for rice in Japanese than for love and that the Japanese language has no equivalent of "I love you." "Like" is used in place of "love. One market researcher told the New York Times, "Traditionally Japan is an unromantic country, and people don't express love’so they buy expensive presents. That's an exaggeration, but you get the point." In Japan, "a difficult labor bode wells" describes how good things arise from bad beginnings. "My teeth float out" means “I'm embarrassed.” “You don’t feel spicy food after it passes your throat” means “out of sight, out of mind.” “An arrow is easily broken, but when three are put together, they are difficult to break," was reportedly first said by the 16th century lord Mori Motonari. Nsake wa hito no tame narazu ( literally "charity is a good investment") means "what goes around comes around." The Japanese equivalent of “don’t cry over spilt milk” is “water running out of the vessel doesn’t return to it” but has a slightly different meaning. Other Japanese proverbs include “time flies like a proverb,” “if you keep your distance from the devil he can do nothing to you,” “Sympathy is not merely for others’ sake” and “yesterday’s enemy is today friend.” Among the expressions used to promote conformity are: "the nail that sticks up will be hammered down," "we are all are one silk sheet," and "the head that stick up above the others gets lopped off." New words created in the cell phone and Internet era include azasu, short hand for airgato gozaaimasu (“Thank you”); ochiru, to sign off from an Internet chat line; jimi, secretly or shrewdly, GHQ, “Go Home Quickly, a word that describes one who does not stay after school for school activities; nikochi, or “two people,” meaning close friends. ; soji, a modest way of describing one’s own speech; baku-baku, a state of ongoing nervousness; and tsubo, being in a pleasurable state. The use of acronyms is becoming increasingly common. Many have their origin in shorthand used in cell phone text messages but now are so widely embraced there is game in which young people carry yellow cards and pull them out if an acronym is used and someone present doesn’t know what it means. Many of the acronyms are insults and using them make those in the know able to say insulting things abut those not in the know. Others include ATM (ahona teishu mo iranai, “the idiot man in my life I don’t need anymore”); AB (amai mon ws betsurbara, “the kind of woman who has a separate stomach for puddings”); GM (Gyudon no hou ga mashi, even gyudon---a cheap fast food---is better than this crap”); FK (fander koi, “Someone with too much make up”); ND (Noge to shite douyo, “what kind of person is this?”); OBM (okubyoumono, a guy too chicken to ask a girl for a date”); DD (daredemo daisuki, “Some who falls for anyone”); and NS (noroyoku yori siekaku, “Someone promoted way beyond his level of competence”). The Japanese number system is based on hundreds not thousands. Japanese often have difficulty working with large American and European numbers such as hundred thousands, millions and billions and sometimes have to write the number down and count the zeros and insert the commas to get the numbers straight. The counting system in Japanese is quite complex. For example, “mai” is used for counting flat objects such as paper, glass and coins; “hon” is used for counting long objects such as pens, strings and movies(because they are shown on long reals); “Satsu” for bound objects such as books and magazines; “hiki” for small animals such as cats and small dogs; and “to” for bigger animals.